With a camera you can easily make a ten-minute walk last two hours. Those who have taken shortcuts with me and my camera before know that they have a tendency to become major detours. This time we were heading to a Lab dinner just walking through King’s College. With me were Diana who is visiting our group for two weeks, and Ellese who is doing her lab rotation with us. Stephen and Catherine were meeting us at the restaurant. We ended up playing around a bit with forced perspective. Here is one of the photos, where Diana is sitting on the ground and Ellese is standing far away on the path. I wanted to have them both in focus at the same time. To get the maximal depth of field I put the aperture at f16, which is the highest f-number on my 50 mm lens. Highest f number means smallest aperture. One thing to keep in mind when you use small apertures is diffraction, Cambridge in Colour has a good text on that. According to their information I am approaching the point where diffraction starts to matter at f16 on a full frame camera like my Nikon D700. A sensor with a higher pixel density will hit this limit earlier, e.g. cropped sensors with high megapixels. If you want to see what the limit is for your camera, check out their diffraction calculator on the link above. I focused somewhere in between Diana and Ellese, and then counted on the depth of field to include them both. Looking at the EXIF information my focusing point was somewhere at around 8 meters. One thing I could have done is set the camera to manual focus and then dial in the hyperfocal distance on the focusing ring, which at f16 for this lens is at 5.26 meters. That would give me the largest depth of field, from 2.63 meters to infinity. The value you get for the hyperfocal distance varies a bit depending on which depth of field calculator you use, since they have slightly different criteria for what is considered sharp. Part of the reason for writing this blog post is that next time I do a shot like this I can just go back here and check what the hyperfocal distance was for my 50 mm lens at f16 (note to future me, it is 5.26 meters). We wanted to create a bit of interaction between Diana and Ellese, and we came up with the idea of having them shake hands. I also wanted them to look at each other. It took a bit of coordination to get them aligned properly. I wonder what the people passing by were thinking. “Diana, can you lower your right hand, no your other right. That’s good, stop, perfect!” Eventually we got something that looked pretty good. We had chosen the location on the path to make sure Ellese who was wearing a dark coat was silhouetted against the gravel. Looking at this picture again I probably should have raised my point of view slightly to avoid intersecting the wall. The post processing was relatively quick compared to if we had done this as a composite image. I did not really need to do anything, but to increase the illusion of them being on the same plane I blurred a bit of the background around Ellese in photohop. You can do this in many ways, but here I used a new trick that Malin Lundgren showed me (blog link in Swedish). You create a duplicate layer (⌘J), then in the menu Filter->Other->High Pass (I use a radius of 10 pixels), invert the high pass image (⌘I), then set the blending mode to Overlay, add a layer mask to hide all, then paint in the regions you want blurry with a white brush. This gives you a nice blur, and good control over where you get it. This works because a high pass filter only retains the fine details in an image, when you then invert it and set the blending mode to overlay you basically subtract the fine details from the underlying image, which makes it blurry. The layer mask is needed to decide which parts of the image should be made blurry. Back to the original topic. 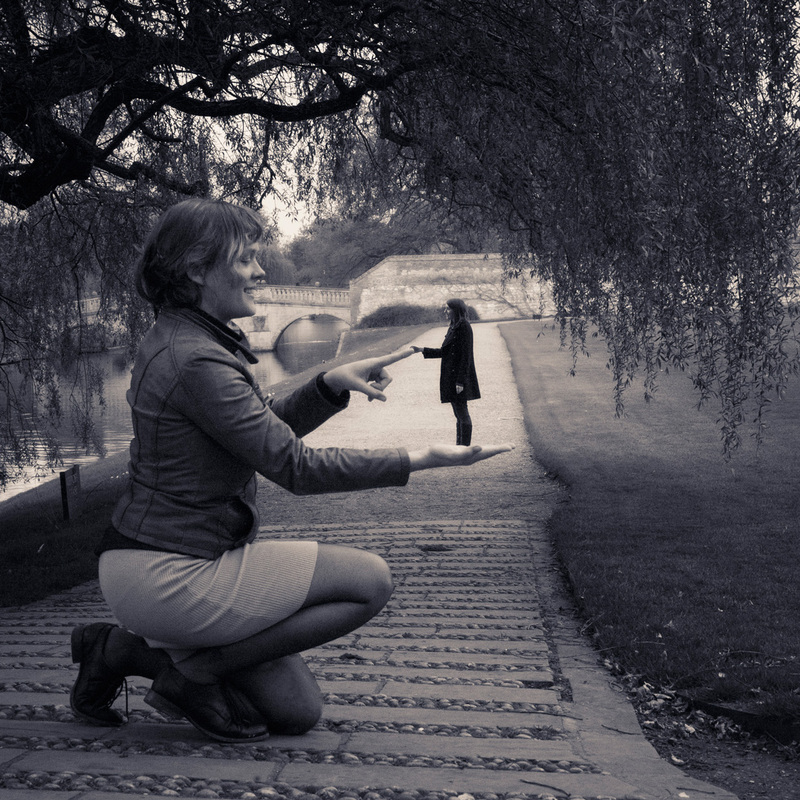 If you google forced perspective then you can see how people have used this illusion in various ways. The best shots usually try to have some kind of interaction between the people in the foreground and background. Apparent eye contact between your subjects is a very powerful to strengthen the illusion. We are going on a hike this weekend with the post doc society, so perhaps we will do a few more of these photos then. Try it out with your friends, it is good fun and gets everyone involved creatively! [ Smiles ] Splendid effect!